The DeWalt DCD771C2 20V MAX* Lithium Ion Compact Drill/Driver Kit is a lightweight drill set, built in a compact way to work flawlessly in tight spaces for a longer period of time. For those who are thinking of furnishing home themselves or involve much into woodwork or masonry work at home, this drill/driver kit is a preferable one within the affordable price range. While this DeWalt DCD771C2 is not a contractor level drill, it houses enough power with proper torque and thrust to complete one man’s work at home efficiently. This small and lightweight kit feels great in hand and it’s nature of being cordless gives it the portability to take it anywhere with little packaging by the user. The protective bag provides with extra advantage to the user while traveling. It weighs only 3.6 pounds. There are many other drill/driver kits in the market with powerful performance. But many of those weighs so much that working longer period with those may cause harm to the body. On the other hand, this lightweight structure gives the user the assurance to stay fatigue free from longer working time. So, those who are not contractors, live a regular life, can also do the contractor’s job for their own home or to give a friend a hand without having the worry of harming themselves. While working in congested areas, this product gives a solid performance because of its ergonomic design. The manufacturer company DeWalt has created here quite a package that has everything needed for primary furnishing works. As well as this product works magic for DIYers, the professional contractors can also get some benefits in some critical situations. The high-performance motor of DeWalt DCD771C2 delivers three hundred unit watts out that can be used for a wide array of applications in various situations. It has 2 interchangeable speeds of high-speed transmission (0 to 450 and 1500 RPM) for different kinds of fastening and drilling usage. ½’ single sleeve ratcheting chuck delivers fair gripping strength that matches the requirement of home-users. Its lightweight and ergonomically facilitated design lets the user use it with comfort for a longer period of use. Even those who are not much used to the drilling works and not accustomed to physical labor, this lightweight drill will give them the assurance of no work-fatigue, even in longer run. Comparing to the other products available in the market, this brings a better and inexpensive deal while maintaining a better build quality than its competitors. This DeWalt DCD771C2 is quite a powerhouse in its kind to drill a huge amount of screws on a single charge. Those who tend to travel for work purpose, this powerful unit can be a good fit for them. Built with metal and plastic, this drill/driver kit feels very lightweight in hand and provides comfort in longer period of time. With only 3.6 pound weight, this machine works better those who are not regular contractors. The lightweight structure will reduce the chance of work fatigue and lessen the chance of any kind of injury. Ergonomically this is a well-designed product that fits in all shapes of hands and its small size makes it easier to grip even for non-professionals. The well-designed shape fits like a glove in hands and provides the user with utmost comfort in longer period of use. Because of the small size of the product it can fit into almost any place and the drilling works can be done even in awkward angels. This feature comes to aid most to the DIYers as well as the professional contractors who are seeking small tool to get the job done. Being a cordless product, this drill/driver kit is easier to take anywhere for worry-free usage. There are many contractors and DIYers who like to keep a drill driver kit in their bag while traveling. This DeWalt DCD771C2 is a good match for them. The motor is one of the bests that DeWalt has ever produced. With 300 unit watts out (UWO), this machine works wonder in a wide array of applications out of the box. From light works to the heavy ones, this machine performs seamless. Though this is much smaller than those of factory standard products, its torque and power gives a balanced performance throughout different kinds of applications. Two Li-Ion batteries give the chance to work relentlessly with one battery while the other gets charged up. As the battery takes less than an hour to charge, it gets easier to do more work in a short span of time. Each battery gives boosted up performance for a longer period of time. Well-made carrying case assures the user a better transportation when needed. Many other manufacturers in the market produce good product but their products do not come with a protective carrying case. Lack of this little thing often can cause damage to the product while being transported. This product comes with a great finishing and despite being an inexpensive one; its build quality satisfies the users in comparison to other products of its class. The perfect blending of metal and plastic provides it powerful performance yet retains the lightweight tag intact. While the build quality and other functions are great, a lack of green indicator light to let the user know that the battery is full is surely a drawback. For this the machine may remain longer on the charger than needed. Once the trigger is released, the brake stops so suddenly that in times, the chuck’s inertia causes itself to overrun and the bit gets released without intention. The plastic chuck here falls short to other products of Dewalt where metal chuck has been used for better performance. This drill set is good for home users considering its price. But, it cannot be used in constructions as using that much would cause it to wear off quickly. While having a bag to carry this drill set is surely a privilege, its nature of piling equipment inside is messy. With a more organized compartmentalized inside this bag could be contractors’ dream. DeWalt DCD771C2 is surely a worthy product of its category. While there are many other brands in the market with driver/drill kit with more or less same configuration, this Dewalt product surpasses almost everyone in terms of pricing and quality. Its well-finished design gives comfort to users and makes them assured that their money has spent for a good product. Though there have been some reports of battery failures from some users, it is quite natural for any kind of electric products. Mostly, its battery life has been praised by users from different corners of the world. The plastic chuck is one major issue one might want to look up. After a little using, the chuck tends to get loosen up releasing the bit without authorization. But this minor problem can be solved with a little firm grip in hand. The portability of this product makes it favorite to the users in moving situations. One of the biggest advantages of this $99.00 deal is it gives so much in such cheap price. 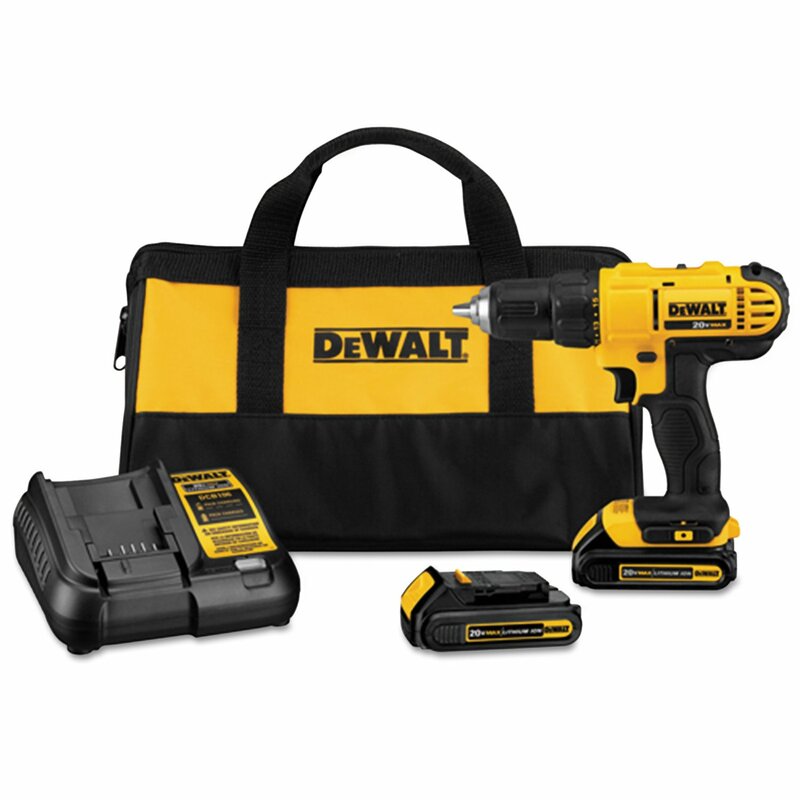 If someone has one set of DeWalt drill/driver kit of some other model, this deal would make him happier even just for the 2 batteries that this package comes with. Then it would be a great addition to the pre-owned pack. The 3 years’ limited warranty will make the users assured that, should something happen to their product, DeWalt has got their back in those troublesome situations. Most importantly, this DeWalt DCD771C2 driver/drill provides a solid performance when tested in longer runs. So, it is safe to say that all those people who are in search of a driver/drill set that fulfills the criteria of superior build quality and supreme performance, can give a thought to buy this one without much hesitation.